Full disclosure, I am not a dermatologist or aesthetician. I do have a background in chemistry and am a beauty enthusiast. 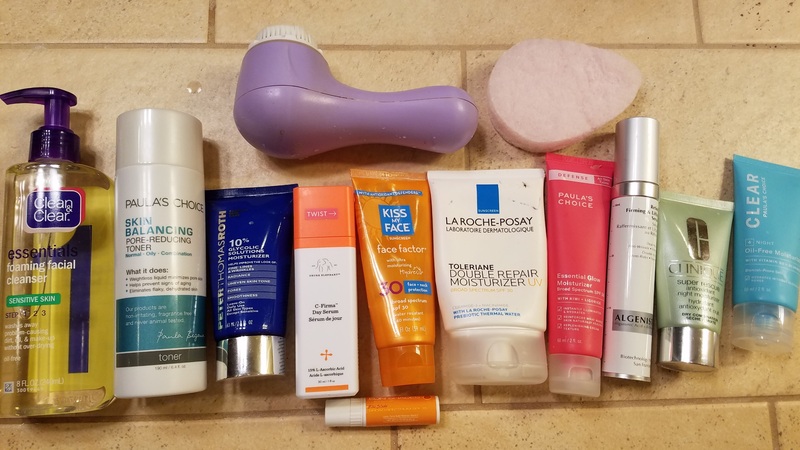 At 57, I am frequently asked what I do for my skin and am writing this blog to share with friends or those interested. Everyone’s skin is different. So I advise you to see a dermatologist or master esthetician to further guide in in choosing the routine that is best for you. In my research I have found that there are key ingredients that should be part of an overall skin care routine. My personal goals are to prevent acne, improve skin texture, discourage whiteheads and blackheads, get rid of and prevent hyperpigmentation and age spots, minimize wrinkles, reduce pore size and prevent further aging. So here are some of the key ingredients that can help with those goals. Proven acne treatment ingredients include: salicylic acid, benzoyl peroxide, glycolic acid, retinol, and zinc pyrithione. Ingredients that help fight skin aging include: retinol, glycolic acid, green tea antioxidants and vitamin C, and broad spectrum sunscreens. Ingredients that work for hyperpigmentation include: broad spectrum sunscreens, retinol, vitamin C, glycolic acid, hydroquinone, and some botanical lighteners such as kojic acid. Moisturizers. The ingredients to look for: hyaluronic acid, ceramides, sodium PCA, glycerin, glycerol, silicones, petrolatum, salicylic acid, and alpha hydroxy acids. Hydroxy Acids are compounds that exfoliate surface cells and encourage cell turnover, helping skin to look and feel younger. There are 2 main types: Alpha-Hydroxy Acids (AHAs) and Beta-Hydroxy Acids (BHAs). Salicylic is a BHA. Beta hydroxy acid penetrates into the pore which contains sebum and exfoliate the dead skin cells that are built up inside the pore. This helps minimize clogged pores. AHAs exfoliate surface cells and encourage cell turnover. The AHA Glycolic acid is small and get into the skin. It boosts collagen production and elastin production; also removes waste and dead skin cells. AHAs are preferred for sun-damaged and dry skin because they exfoliate on the surface of skin. Sunscreen MUST be applied when using an alpha hydroxy acid product. Just like we need to eat antioxidants to defend our bodies against free radicals we need antioxidants in skin care products to help protect the skin from deterioration and defend against environmental assaults that lead to signs of aging. Antioxidants: Green tea extract, ferulic acid, grape extract, resveratrol, quercetin, vitamin C, vitamin E, epigallocatechin-3 gallate, superoxide dismutase, willow herb) extract, feverfew extract, and licorice extract. These are the products I am currently using. There are lots of great products and even more worthless ones. I trust Beautypedia.com for their reviews. Look there for recommendations or to research what you are currently using. Don’t rely on Amazon’s reviews which are just users and not skin experts. Look the product up on Beautypedia and there you will find expert reviews. 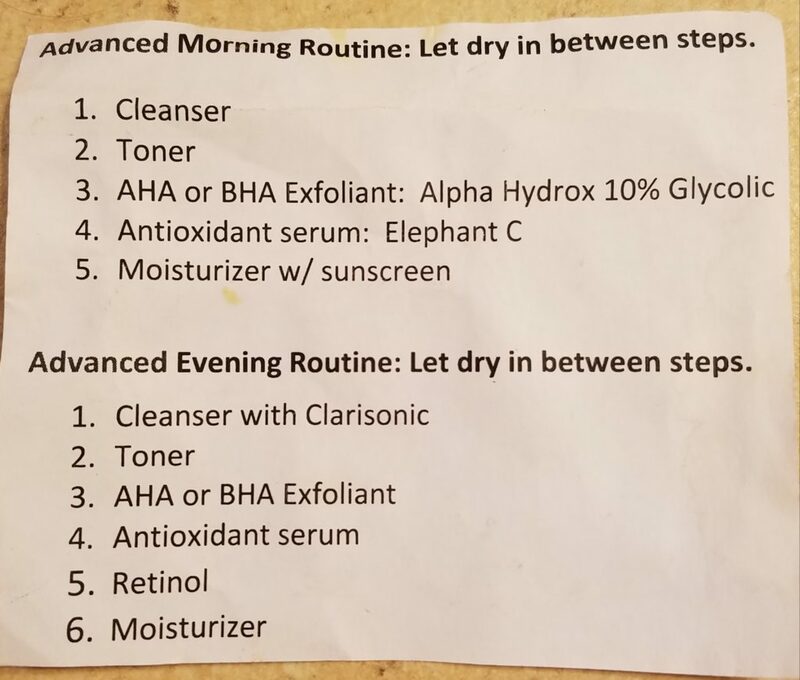 Drunk Elephant’s C-Firma Day Serum: large list of antioxidants, 15% vitamin C packaged in a way to keep ingredients stable. Algenist’s ELEVATE Advanced Retinol Serum: contains a mix of retinol and other beneficial anti-aging ingredients such as cell-communicating, antioxidant and replenishing ingredients. Kiss My Face Face + Neck Face Factor 30 Broad Spectrum SPF 30 (Not the 50): Inexpensive, broad-spectrum, mix of antioxidants, anti-irritants and emollients, cell-communicating ingredients. 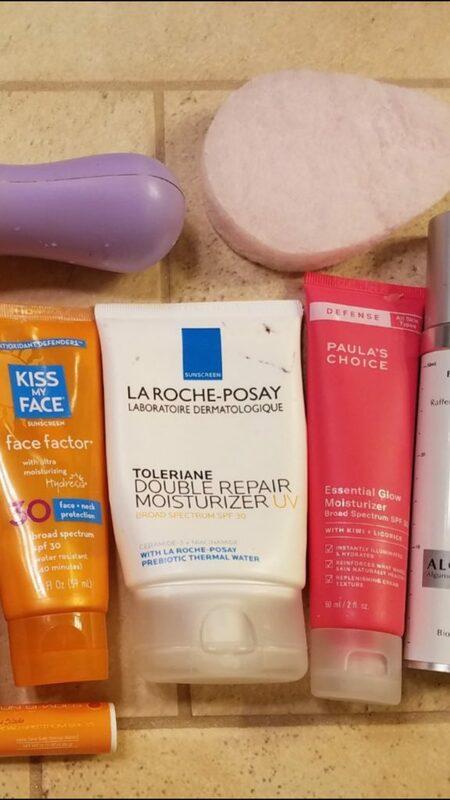 La Roche-Posay’s Toleriane Double Repair Moisturizer UV Broad Spectrum SPF 30. Inexpensive. I alternate between these three face sunscreens. Use on face, neck and chest. All have zinc without the chemical sunscreens that can cause cancer. Zinc acts as a physical shield between skin and the sun. That should be in all sunscreen. DO NOT USE the chemical sunscreen ingredient oxybenzone. For more info research that on EWG.Org. Okay chemicals to use are: octinoxate and octisalate. Zinc PLUS Titanium can cause breakouts. I also apply a lip sunscreen with SPF all day long. I also use a body sunscreen on hands and any other exposed skin during the day even if I am not going outside. Wear sunscreen even if you are not planning on going outside. UVA rays inside a building cause wrinkles and UVB (B for beach or burn) causes skin cancer and wrinkles. So yes, you do want to use a sunscreen even if you are not going to the beach. I use a Bufpuf twice a week to gently exfoliate my skin. This removes some of the unhealthy, built-up skin cells on top of the surface. The Bufpuf has to be kept exceptionally clean. Links to the products I mention are below if Amazon has them for sale. This entry was posted in General by Maria Faires. Bookmark the permalink.